Abnormal levels of muscle tension are often associated with subluxation. When a spinal bone (Vertebrae) is misaligned (Subluxated), spinal nerves can become irritated leading to many negative effects. By interfering with the communication between the brain and the rest of the body, a Vertebral Subluxation leads to improper electrical impulses that could lead to poor health. 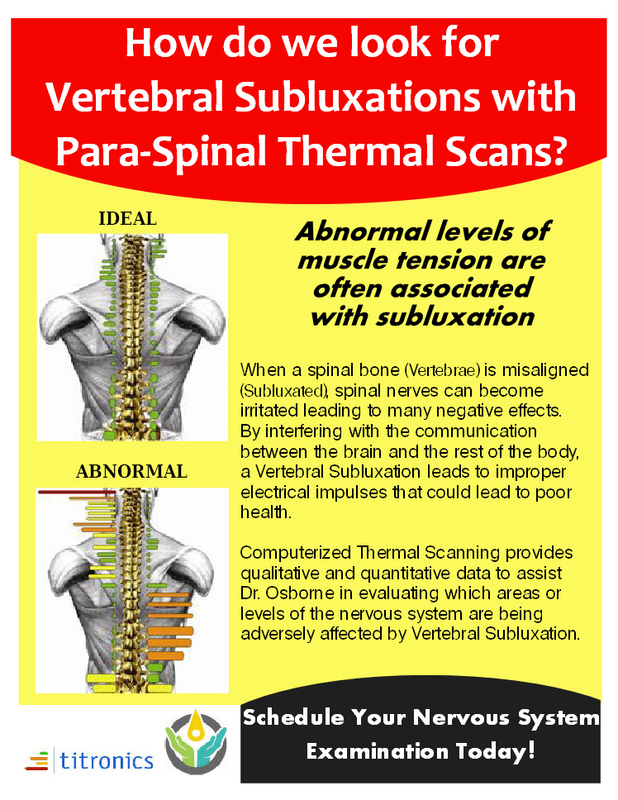 Computerized Thermal Scanning provides qualitative and quantitative data to assist Dr. Osborne in evaluating which areas or levels of the nervous system are being adversely affected by Vertebral Subluxation. Schedule Your Nervous System Examination Today! Your brain and nervous system control and coordinate ALL functions and organs in your body. Interference to your nervous system from Subluxations has an effect on your body’s ability to function normally. Doctors of Chiropractic are the only professionals trained to detect and correct vertebral subluxations. Nothing is more important to your health and well being then a properly functioning spine and nervous system. Chiropractic care is focused on correcting subluxations that interfere with your nervous system and your innate potential to be healthy. Performing these scans regularly throughout your care is the best way to ensure that we are correcting your subluxations and returning proper function to your nervous system. Your health depends on it!